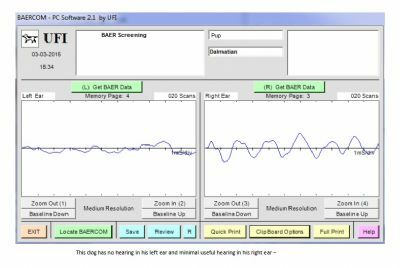 A BAER test is the only 100% reliable method for determining that a dog is deaf (or for measuring the extent of its hearing loss). BAER (pronounced "bear") stands for "Brainstem Auditory Evoked Response" and is a procedure using computers to record the electrical activity of the brain in response to sound stimulation. 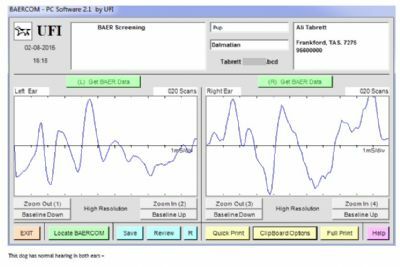 This is the same test used to check the hearing of human infants, and measures the same range of hearing. This means that the test does not measure the full range of canine hearing, but it will tell you if your dog has hearing within the normal human range (some dogs will test as "deaf," but will still be able to hear very high pitches). The test is not painful and can be performed on any dog over six weeks of age. A puppy's ear canals don't open until they are about two weeks old. Sedation is usually not necessary, but some dogs (especially puppies) don't like being restrained, or having wires hang from their face, so it can be performed while the dog is sedated. A clicking sound is directed into the ear through a foam insert, earphones, or headphones and the brain's response is recorded. Each ear is tested individually and the test generally lasts for only 10 to 15 minutes. A lot of the same things that cause hearing loss in humans cause hearing loss in our pets. Genetic defects can cause a dog to be born deaf; this is known as congenital deafness. A dog can also lose its hearing due to an ear infection, injury to the ear, or may experience gradual (or sudden) hearing loss due to old age. Exposure to loud noise can cause temporary or permanent hearing loss, as can certain drugs. Congenital deafness can occur in any breed of dog from a variety of causes but breeds with white pigmentation, such as Dalmatians, Australian Cattle dogs and Jack Russell Terriers are more commonly affected. How do I know if my puppy is deaf? The only way to know for sure if your dog is deaf is with a BAER test. Just as in the litter, if you own another dog, it can be difficult to immediately determine if the pup is deaf as it will notice what the other dog does and tag along. The only way to know for certain is to have the dog BAER tested. The two tests below show a pup with normal bilateral hearing (good hearing in both ears) and a pup with almost no hearing at all.